We set out to find the businesses that are doing the most heroic work to hire our nation’s heroes. These 10 get our commendation for their commitments to hiring and training vets. You gave your service to our country, and now you’re giving your service to the workforce. The good news is that the workforce wants you, with 88% of employers recently surveyed in Monster and Military.com’s recent Annual Veteran Talent Index saying that veterans’ skills are relevant to a civilian career, up from an average of 78% since the survey was first run in 2011. Yet while 90% of vets say that, when job seeking, it’s critical to consider companies that market themselves as veteran-friendly—with dedicated veteran hiring, onboarding, affinity groups, and training—still nearly half of companies surveyed in that study did not have such an initiative in place. What the company does: Lockheed Martin is a global aerospace, defense, security, and advanced technology defense contractor. What we liked: Of all the companies surveyed, Lockheed Martin had the highest percentage of veterans hired in 2015 (by a wide margin) and the second highest percentage of veterans as a share of the overall workforce. Plus the company has a dedicated five-person Military Relations Team—in place since 2005 and made up of vets from the Air Force, Army, Navy and Marines—focused on full-time recruitment outreach to transitioning veterans. The company also offers affinity groups that provide mentoring opportunities, and a Military/Veterans Leadership Forum that focuses on creating services to support and develop veterans at the company. What the company does: Union Pacific is a railroad franchise that transports goods across 23 U.S. states. 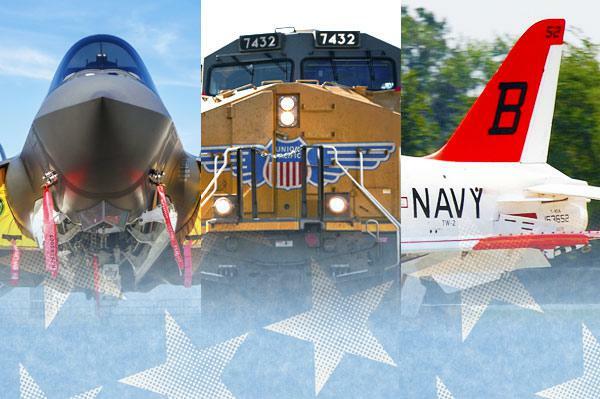 What we liked: Union Pacific had impressive veteran hiring results in 2015—second highest of our nominees, with nearly one in four hires being ex-military. Plus, the company came in third for veterans as a share of the total workforce. The company owes these numbers to the fact that it actively recruits at military transition offices, military education offices, as well as reserve and National Guard units. We also liked that UP has a dedicated employee resource group (UPVETS) and that it compensates the difference between military and company pay for active National Guard or reservists called to duty. What the company does: USAA provides financial services—insurance, banking and investment products—to service members and their families. What we liked: USAA cracked the top 3 thanks to its high share of veteran hires for 2015 and overall. But we were also impressed with numbers that swelled to 32% and 24% respectively when military spouses were figured in, and the fact that, since 2013, USAA has aimed for 30% of hires to be vets or spouses. Besides offering a resource program to aid employees with the transition to corporate work, USAA also offers skill-building programs like VetFIT and Combat-to-Claims, which develop workers’ talents in Java programming and claims adjusting. Find jobs at USAA jobs on Monster. What the company does: Booz Allen Hamilton is a management consulting firm that specializes in technology, strategy and engineering. What we liked: The consulting firm boasts the largest veteran percentage in its workforce among all companies surveyed on this list, along with the fourth highest for 2015 hires. The company offers two employee resources groups—the Armed Services Forum and Military Spouses Forum—to help veterans and their families make the shift to civilian corporate life, with mentoring, career guidance, and professional development. We also liked that the company has a team dedicated to helping former military personnel coordinate their benefits. What we liked: Of all the companies surveyed, BAE Systems had the second highest veteran retention rate, with 97.3% of 2014 hires staying on for at least one year. The company also has specific plans to exceed 1,200 veteran hires in 2016, with an emphasis on females and diversity. This year, the company’s military outreach program consisted of more than 40 events, and in 2016 it plans to expand to more than 50. To help recruit, BAE Systems has a dedicated recruitment team consisting of veterans and a program called Camo to Corporate. We also liked the company’s Warrior Integration Program, which provides service members injured in the course of duty with leadership development and career pathing. What the company does: SpaceX designs, manufactures and launches rockets and spacecraft with the ultimate goal of allowing people to live in space. What we liked: What stood out most was to us, besides the solid double-digit percentages on vets in the workforce and 2015 hires, was that in 2014 the company had a 95% retention rate among the former service members it brought on. On that indicator, SpaceX placed third among all the nominees. Also, while it does not have a specific veteran development programs, SpaceX has been committed to veteran hiring, with dedicated veteran recruiters and having joined The White House’s Joining Forces Initiative and signed onto the 10,000 Strong Initiative in Los Angeles. Find jobs at SpaceX on Monster. What the company does: First Data is a payments solutions company that processes debit and credit transactions, among other things. Find jobs at First Data on Monster. What the company does: Xcel Energy is an electric and natural gas company serving eight states in the West and Midwest. What we liked: While Xcel Energy only just added a full-time dedicated veteran recruiter in 2013, the company has strong numbers thus far, and has set a goal to make 10% of 2016 hires veterans. The company has a program called The Value of a Veteran focused on recruitment, hiring and retention—and Xcel boasts an impressive retention rate of 90% of full-timers hired in 2014. Find jobs at Xcel Energy on Monster. What the company does: Honeywell invents and manufactures a wide range of commercial and consumer products, from aircraft engines to thermostats. What we liked: Honeywell aims to hire an average of 500 veterans per year, which shows in the nearly-double-digit percentage of vets in the workforce. Also, for employees called to service in the National Guard and Reserve, Honeywell provides full pay and benefits at 100% for up to 18 months. Find jobs at Honeywell on Monster. What the company does: David Weekley Homes is a residential homebuilder that works along the East Coast, as well as in Texas, Colorado, and Arizona. What we liked: David Weekley Homes pairs new veteran employees with a seasoned veteran mentor, and frequently checks in to see how these employees are adjusting. The company goal for 2016 is for 7% to 10% of hires to be former service members. Find jobs at David Weekley Homes on Monster. We asked each of these experts to nominate the 10 companies they thought were doing the best things for veterans. Monster then reached out to each of the nominees for the following additional information: what percentage of the company’s 2016 hires were veterans; what percentage of the total workforce is veterans; what the retention rate was for 2014 hires; what 2016 recruitment plans it had for veterans; whether it has a dedicated vet recruitment team and whether any of that team is ex-military, and what kind of special programs it offers for onboarding, development, and retention. We ranked first on 2015 hires, then on total workforce, using the other data points to inform our final rankings.